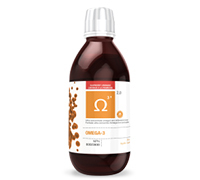 One of the purest and most concentrated OMEGA-3 Oil on the market. Goals: Boost the immune system, Improve overall good health, Improves memory, concentration and mental health, Lose weight, Pain relief, Reduce inflammation, Relieve joint pain. Despite the fact that ATP’s OMEGA-3 possesses an unrivaled concentration in today’s super saturated market and provides incredible therapeutic benefits (4260 mg of Omega-3 per 5ml, 1908 mg EPA, 920 mg DHA), the key comes from it’s superior quality and stability. ATP sources only the smallest European anchovies and sardines to create its Omega-3 fish oil – providing the absolute highest purity available worldwide. Recommended Use or Purpose: Source of Omega-3 fatty acids for the maintenance of good health. Helps support cognitive health and brain function. Helps maintain and support cardiovascular health. Helps to reduce serum triglycerides/triacyclycerols. Children 1-13 years: ½ teaspoon once a day with meals. Children 14-18 years: 1 teaspoon once a day with meals.